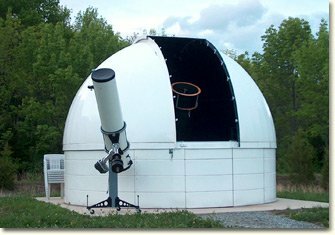 The Sterling Hill Astronomy Group holds occasional viewing sessions at the Ellis Astronomical Observatory on the grounds of the Sterling Hill Mining Museum. Located in rural Sussex County, the observatory offers excellent dark-sky viewing conditions far from major urban sources of light pollution. Members use the observatory's massive 20-inch and 12.5-inch reflector telescopes for nighttime viewing, and a Hydrogen-Alpha telescope for safe viewing of the Sun. The Planets — see the phases of Venus, polar ice caps on Mars, colored cloud bands and moons of Jupiter, incredibly detailed rings of Saturn and its moons, the icy blue world of Uranus, and green-tinted, distant Neptune. Star clusters — tight groupings of stars that are positioned thousands of times closer than those of our own stellar neighborhood. Constellations — our instructors will make you an expert in learning the constellations and all of the brighter stars using special green pointing lasers. Our Moon — incredibly detailed craters and mountains. The Moon will be viewed under special filters to reduce the brightness. Get the feeling that you are in orbit floating above the surface! The Sun — safely view the sun with our special Hydrogen-Alpha telescope. See amazing solar flares and prominences (in red hydrogen alpha light) loop and burst above the sun's surface. In order to go into the observatory, one must be a part of the occasional viewing session. To see dates and times please click here.